Okay, so I was all ready to put this post up, when I realized that I'd taken 50 some-odd pictures without the data card in the camera. Hence, this very abbreviated step-by-step process for which I apologize. You see, I'm a little tired and a tad hung over from eating, drinking, dancing and partying into the wee hours of the morning with our wonderful group of friends last night (shout out to Lisa, Jim, Adrienne and Jim). I can't party like a rock star anymore, but I can try, and it didn't matter one bit that we were the only people in the club over 20 (ummm...way over). That I was able to get this simple, yet lovely Mediterranean dish from Malta made at all is a minor miracle...So, despite the limited number of photo's, sometimes you just have to go with what you've got! Located in southern Europe, the country of Malta is an archipelago situated centrally in the Mediterranean sea. To the south is Sicily and to the east, Tunisia. 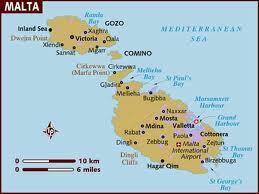 Malta is one of the world's smallest countries and also one of the most densely populated. Throughout history, Malta has been a strategic point for the Phonesians, Greeks, Normans, Sicilians, French, and the British, who ruled the country until 1964 when it gained independence. The country's fertile soil and warm climate make for a huge variety of seasonally fresh fruits and vegetables, which are typically used in salads or as fillings for pastry such as pastizzi. Cuisine can be described as rustic, with it's traditions influenced by the indigenous people as well as the Sicilians. Cheese, fish, pasta, rice, stewed and stuffed dishes, rustic bread as well as desserts that often use dates and almonds are but a sampling of the spectacular Mediterranean food of Malta. In a large mortar and pestle, crush fennel and coriander seeds. Add garlic and pound to paste. Add chopped herbs and zest of 1 lemon and mash together. Juice both lemons and stir into olive oil. Add herbs and season to taste. Store in a jar and let sit for about 1 hour to allow flavors to blend. Break up cauliflower into flowerettes and place in steamer. Steam for about 7 minutes, or until just tender. Half the zucchini lengthwise, then thinly slice into semi-circles and steam for 4 minutes, or until just barely tender. In a large bowl, add steamed cauliflower, peas, Lima beans and zucchini. Add enough dressing to taste, top with feta and serve warm along side thick slices of crusty bread, which can be dipped into dressing for an extra treat. Final Assessment: This is a wonderfully easy, healthy and satisfying salad eaten alone or along with a pasta dish. This dressing can be used for any other vegetables or even as a marinade for chicken or fish. One taste and you'll feel as though you've been transported to the Mediterranean. Check out my friend Christopher's art! He's also the mastermind behind Enjoy Life with Breakfast and Enjoy Life with Chocolate! As always, this looks amazing. I definitely would have ate more vegetables had I grown up in your house! I love warm salads. I do them with all sorts of veggies. Your dressing is unique though! Yes, I'd never made a dressing like this one, but it worked beautifully with the vegetables - really enjoying your blog, btw!